Bigos is a hunters stew. The old timers threw everything in the pot with cabbage and sauerkraut and kept it on the stove for days on end. As the pot emptied, they added to it. It was always bigos, but it was always different. You will find many recipes for bigos. They are all based on sauerkraut with various additives. Aside from the sauerkraut, the most important ingredient in every recipe for bigos is cooking time. Good Bigos takes days to make. Properly made it is heated, simmered, and cooled several times over several days. This recipe is for a relatively small amount of bigos. In many Polish families huge amounts are made around Christmas time and guests are sent home packing containers of bigos. If you want to do that, just scale this recipe up. You can make a large amount and freeze it. To about two pounds of drained sauerkraut, add about one half pound of kielbasa and a half pound of boneless pork and a cup of dried prunes. If you have smoked prunes, they are preferred. Some people add a shredded cabbage to the mix at this point. It is not necessary. Simmer the mixture and add about 5 tablespoons of tomato paste, a large onion (chopped) and a clove of garlic (chopped, squeezed or grated). As it develops you can add some bacon if you wish – or anything else for that matter. Season it with salt, pepper and marjoram to taste. Simmer it all day. Be sure to add water every now and then. And then simmer it again at least one more day. The best bigos simmers for at least five days. Bigos that is ready is brown. This is a picture of one persons interpretation of bigos. Notice that it is brown, has big pieces of cabbage and a lot of different meats. 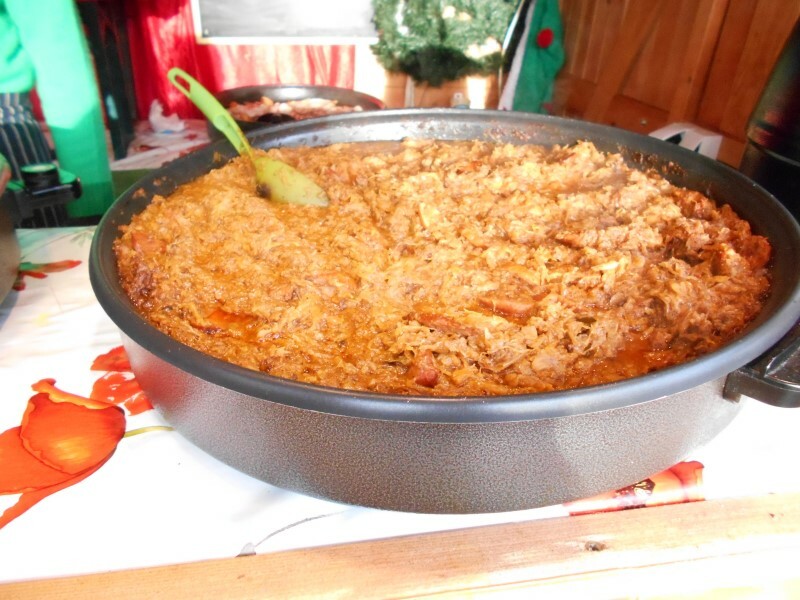 You can click on this picture to see a bigger image of what this bigos looks like. And click on the one at the top left to see what bigos with more sauerkraut looks like. It is not a pretty dish in its own right. To make it look great, serve it in the Polish country fashion by using a nice Polish pottery bowl.